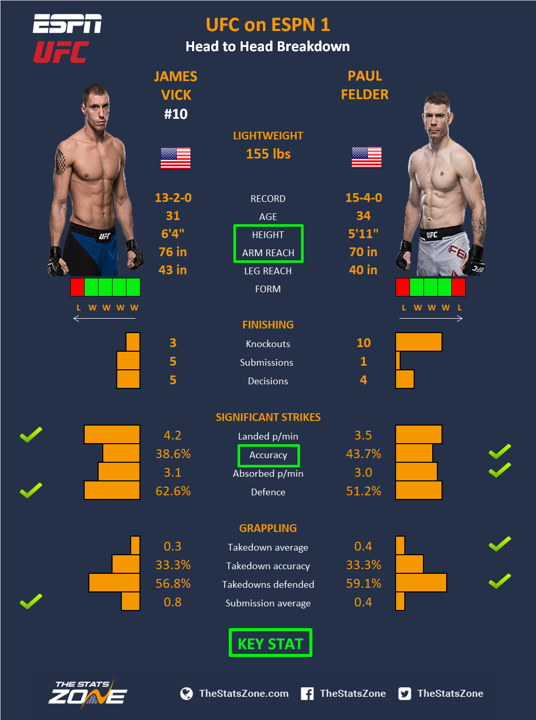 The loss of UFC 233 is 234’s gain as James Vick vs Paul Felder is one of a few fights that have been rescheduled for the first UFC on ESPN event. Vick was humbled in his last fight against Justin Gaethje. While sitting proudly on a record of 13-1 he delivered a lot of trash talk before the fight to be put out cold in the first round so he is desperate to get back to winning ways but has a beast to get through first. Felder has been on the wrong end of some unfortunate scheduling in his last couple fights but instead of moaning he took the opportunity to move up to welterweight in his last fight and take on Mike Perry on short notice. He narrowly lost a decision but he fought most the fight with a badly broken arm and was unfortunate to walk away with another loss on the record. Both fighters will come out aggressive and won’t give an inch. This fight is likely to be a violent stand-up battle interrupted by skilled grappling. Vick has the height and reach advantage but Felder has the power advantage so movement will be key for Vick to win the exchanges. These exchanges are likely to lead to clinches and takedown attempts where Vick will also be confident of wrapping up a submission. However, if you underestimate Felder for a second you will be in trouble. His striking is top of the game and he has the technique to make up for the reach discrepancy. His power also makes him incredibly dangerous in the grappling exchanges with vicious elbows that can end a fight or set up a submission of his own.